Jill Stuart beauty needs no introduction. Just the thought of her beautiful products makes me sigh with happiness! The products are absolutely amazing - from the pretty girlie colours to the beautiful packaging to the high quality of the makeup. HOW I WANT EVERY PIECE! Not to mention the makeup counters are just amazing and make you want to buy every piece xp Today I have the Jewel Crystal Eyes 105 Blooming Roselite palette from the Bare Petal Spring 2012 collection that I hauled in HK. "A fresh and vivid color collection, like a dress of dancing flower petals. 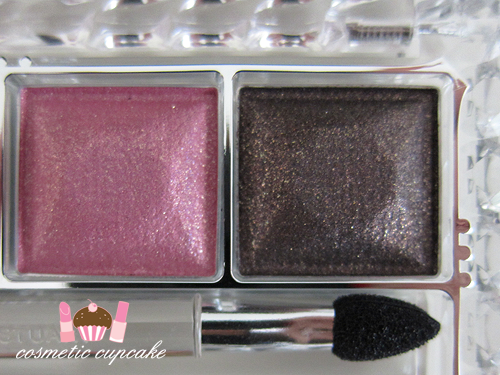 Limited edition colors that give you cute, gorgeous eyes. A set of 4 eye colors to create radiant eyes with layers of pure color and shine, like a sprinkle of dazzling stones.. now contains "Enriched Milk Base". Thanks to its rich texture, the milky base blends seamlessly with the pearlescent pigments for rich, clear and glossy color with dazzling shine. Contains Pure Crystal Powder." The Jewel Crystal Eyes 105 Blooming Roselite palette is packaged in the signature clear case but as it's a limited edition palette it has purple flowers on the front. The palette includes a mirror and a double ended sponge applicator. It is just so so pretty! 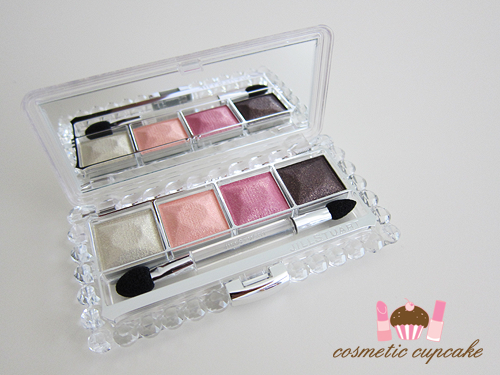 The palette consists of 4 beautiful shimmering Spring shades. 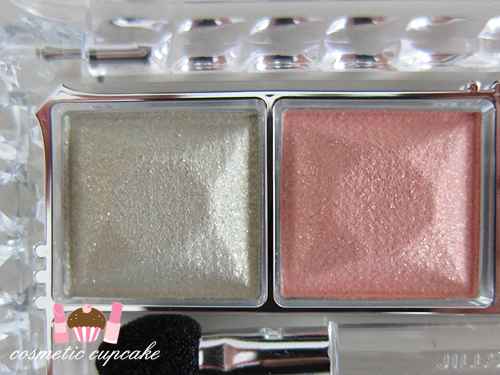 From L-R: Jewel Crush which is a gorgeous pale mint gold highlight; Jewel Shine which is a peachy shimmer lid colour; Jewel Cream which is a pretty rose pink and Jewel Shade is a dark brown to line the eyes. The colours just scream Spring to me! Overall: I am head over heels in love with this palette. What can I say - I am an absolute sucker for Jill Stuart and I just had to own at least one of her Jewel Crystal Eyes palettes! And I love limited edition products so even better ;) The shades are perfect for Spring I think and the shadows are quite pigmented and blend very easily. When worn altogether it creates a gorgeous feminine look. The colours aren't super unique but I think they look great together. For someone who struggles for colour combinations I love palettes as you know the colours included will always work! My only issue with the palette is just how sparkly the shadows are. They contain quite a lot of shimmer so less is more really or else you end up looking a little glittery! Details: The Jill Stuart Jewel Crystal Eyes 105 Blooming Roselite palette can be purchased in Hong Kong for $410HK; Japan for ¥5,000 (¥5,250 including tax) and in Taiwan for NT$1450 or online from Yesstyle.com.au for $74. It may be a little hard to track down now as it was released in January 2012 as a limited edition release unfortunately. 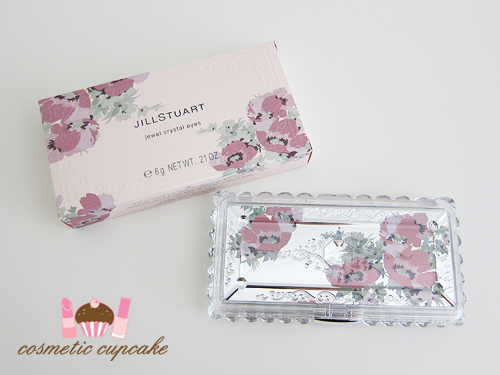 Do you own any Jill Stuart makeup items? What's your favourite? Thanks for looking as always! 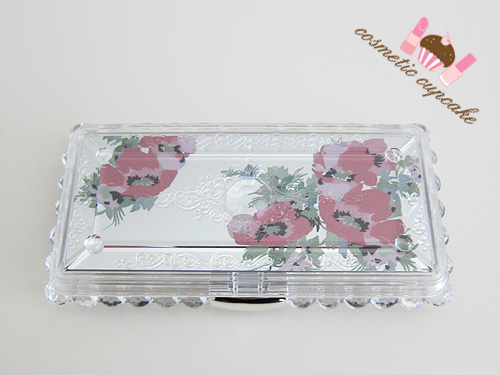 =) Don't forget to enter my 2nd birthday giveaway here! 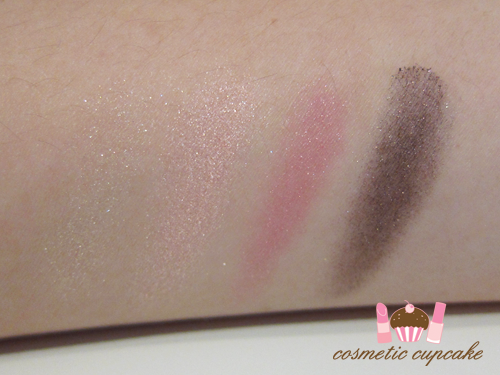 Hi Chelle, this palette is such a beauty! u can definitely wear it during the day, simple colors but the glitters make all the difference. Jill Stuart always has some of the prettiest counters! 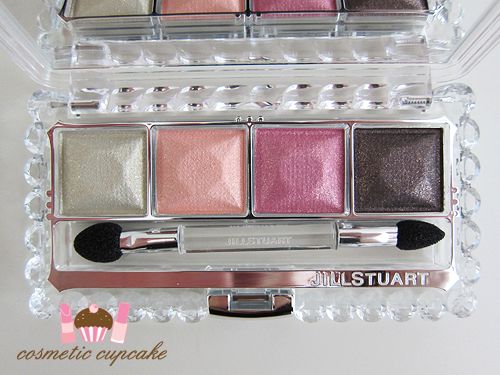 I so desperately want to get a Jill Stuart palette! A very nice palette though not a color combination that I would go for - I love the floral image on the packaging. The two lighter colors dont seem to have much color payoff-they seem to be mostly glitter? I really like the most intense pink, it's gorgeous. Oh it's so pretty! I love the packaging and the shimmery colours. This is such a must have!